Foldable table base is the bottom portion of the Lorell Foldable Round Hospitality Table that offers a great place for impromptu meetings or socializing. Base attaches to the top portion - a round tabletop - for a complete table. 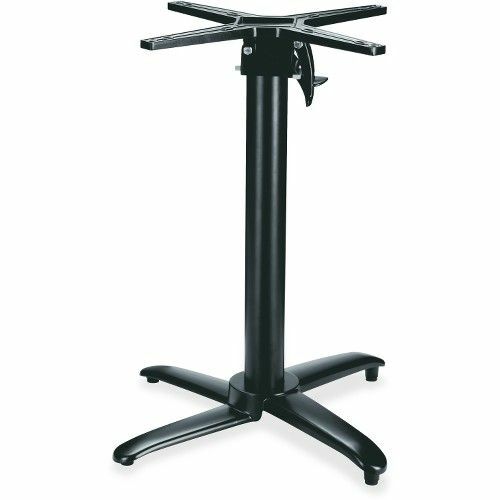 Extra heavy-duty base is made from aluminum and cast iron for stability. Leveling feet help provide a level table on rough surfaces. Base features a powder-coated finish for durability. When the table is folded, the tabletop securely hangs vertically from the base so staff can easily clean around the table or easily nest it with similar tables for compact storage.